How to stay safe during the outbreak of WannaCry ransomware? Have you ever had that experience where you fire up your pc with excitement to do something fun and productive and see that all of your files have been deleted? That pretty much explains why the notorious encryption bug is called Wannacry because it encrypts all your PC files and put them behind a paywall. You pay 300 bitcoin to the said account and all your files will be decrypted. It has been regarded as one of the worst made ransomware in the history of computer viruses and cyber terrorism. More than 150 countries have been affected by the rapid spread of Wannacry with organizations like FedEx, Hitachi, Renault, Russian Ministry of Internal Affairs, Saudi Telecom, Major healthcare providers in UK and Telenor Hungry being the serious victims of the attack. So rather than giving you a lesson on the history of ransomware and what kind of exploits Wannacry uses to get hold of your files, understand what you need to do to protect yourself from this malicious program. Wannacry is a ransomware so it asks for money in return of giving you back the access to your files. If for some reason your computer gets infected, never pay up. Why? Because there is no guarantee that the ransomware will leave any back door program in your system that could exploit you again in the future. Backup your most valuable files and put them in a detachable drive somewhere safe. Be very careful about opening links through your emails. Wannacry attacks start with a phishing email that infects the system and spread the virus to the network it’s connected on. Windows XP users are most vulnerable to this attack so if you are still on windows XP…..wait why are you still using Windows XP? Serves you right if you get infected. Update your antivirus with the latest patches and those running latest iterations of windows should apply the latest patch. If you still see that red screen one morning that is making everyone cry, treat it like it’s an infected one from the walking dead and isolate that system immediately from Ethernet and disconnect it from the wifi network. Do not shoot your PC or try to chop it down with any axe and stop watching so much walking dead. Tell everyone in your workplace to be careful with the fishy email (pun intended) Google how to not be a victim of a phishing attack. Last but not the least……..pray. Only God can save humanity now from this apocalyptic situation and the evil masters of Wannacry. So that’s it. 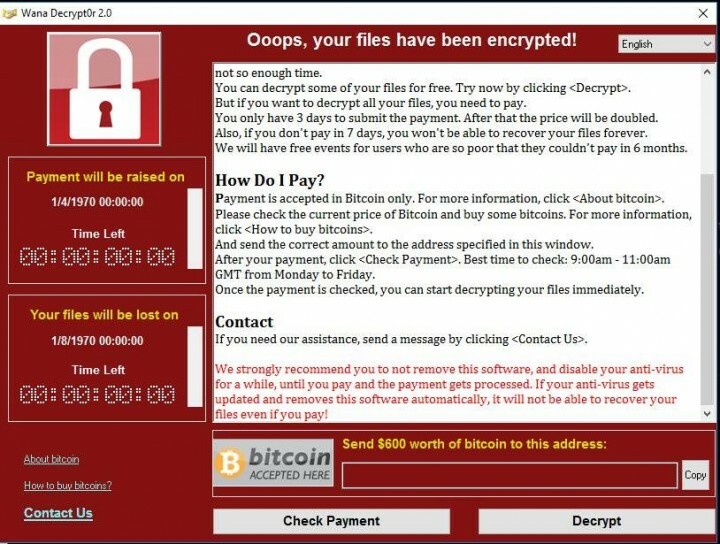 Stay safe and raise awareness about Wannacry at your workplace because by the time this is being written down, there is no stopping the onslaught of this ultra-evil ransomware.